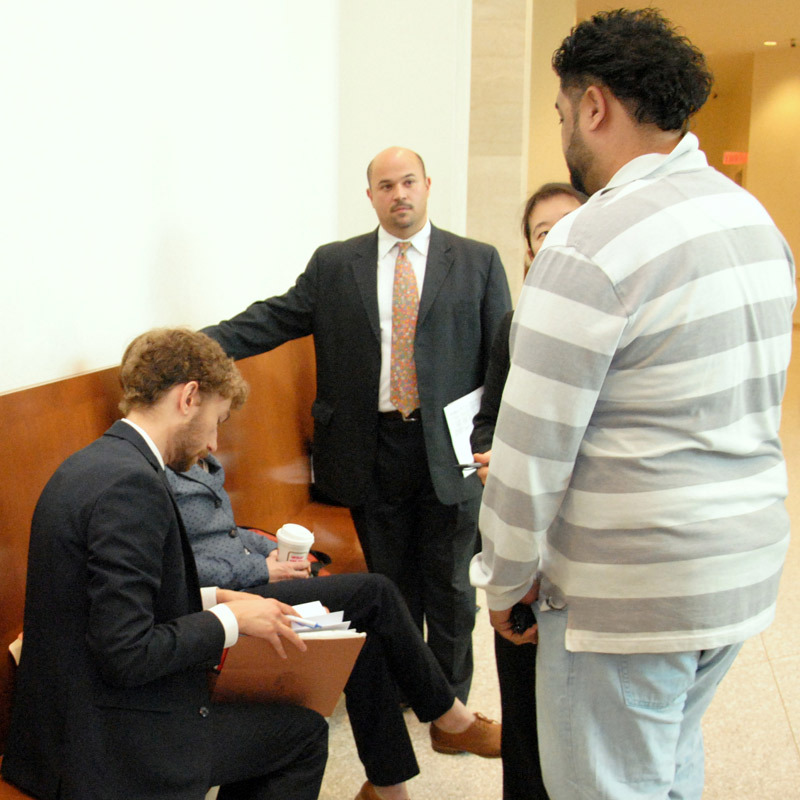 On Wednesday and Thursday mornings at the Housing Court, volunteers offer legal assistance to a packed hallway of pro se landlords and tenants. We hope our readers saw this New York Times article featured in last week’s issue of BBA Week. While we appreciate the shout out to a 2012 study by the Boston Bar Association (thanks, NYT! ), the article included some sobering statistics that shed light on the impact of a booming real estate market on tenants. Massachusetts experienced an 11 percent increase in evictions between 2010 and 2013. The majority of people facing evictions are people of color, people with disabilities, people who have suffered extreme health crises or a long-term chronic illness. So, what can be done? Is there any way we can help reverse this startling trend? Well, we wouldn’t be Beyond the Billable if we didn’t offer our readers some way help solve the problem. 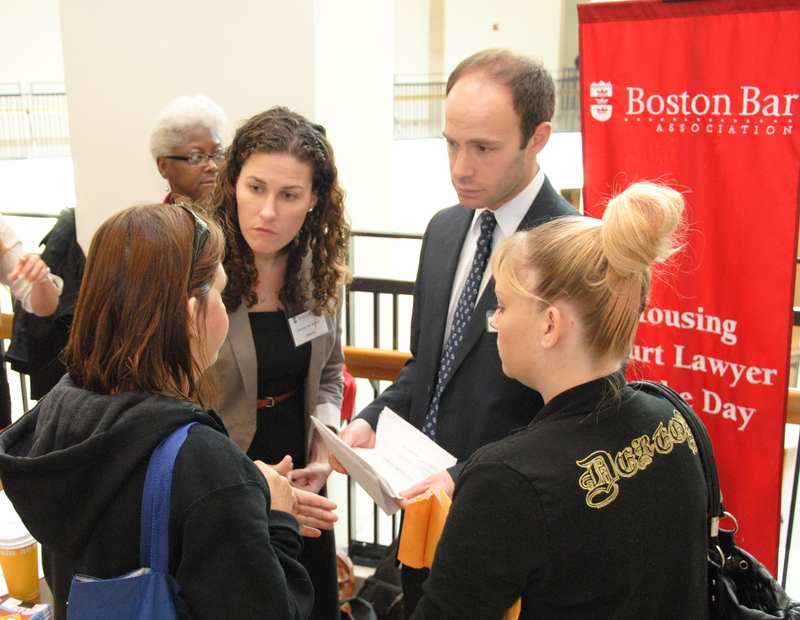 The BBA’s Lawyer for the Day in the Boston Housing Court Program allows lawyers to give back and directly affect rising eviction rates by assisting unrepresented tenants and landlords directly on site at the Boston Housing Court on eviction day. Consider the following when reading the statistics below – the BBA’s 2012 study on Civil Right to Counsel found that renters with lawyers were two times as likely to avoid eviction than those without. So, what type of difference are we making? Since the program’s inception in 1999, volunteers have assisted more than 15,500 landlords and tenants. This year alone, volunteers assisted over 1,000 individuals. Impressive numbers aside, there’s always more to do — and we need your help. If you are interested in helping tenants who are facing eviction, and landlords dealing with housing issues, sign up for the upcoming Landlord Tenant Pro Bono Training on October 28th from 3-6 pm at the BBA. Click here to learn more or contact BBA Public Service Programs Coordinator Katie D’Angelo at kdangelo@bostonbar.org for more information about the program. 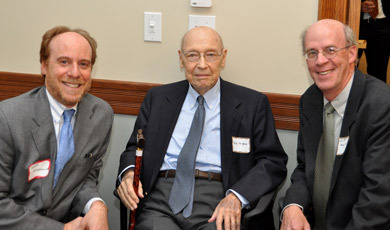 Wiley Vaughan (center) with Sandy Moskowitz of Davis Malm & D’Agostine (left) and Christopher Pitt of Robinson & Cole (right). We know that our readers are familiar with the Boston Bar Association’s Vaughan Fund, which supports the Lawyer for the Day in the Boston Housing Court Program. However, as we look forward to celebrating the 15th year of the program on April 10th, Beyond the Billable wanted to give our readers a firsthand look at the man who inspired the fund. In 1999, Herbert “Wiley” Vaughan helped launch the Lawyer for the Day in the Boston Housing Court Program. Wiley enjoyed a lengthy 47-year career as a highly respected real estate lawyer at WilmerHale LLP before retiring from the firm in 1995. After his retirement, Wiley continued to work with organizations and causes he believed in, including the Boston Bar Association and representation for pro se litigants. When the Pro Bono Committee of the BBA’s Real Estate Section was attempting to create a program to assist individuals and families facing the loss of their homes as well as landlords in need of a better understanding of their rights, Wiley jumped at the chance to lead their efforts. Through his tireless work, he was able to secure not only a tenant’s advisory table at Housing Court, but also a landlord’s table for landlords who qualified under income standards. Thanks to his dedication and support, Wiley was once nicknamed the “Father” of the Lawyer for the Day Program. Since the Program’s inception 15 years ago, more than 12,000 volunteers from law firms, solo practices and in-house corporate legal departments have provided legal assistance and advice to more than 15,500 unrepresented tenants and landlords. Join us in celebrating Wiley, the program, and others, at 5:00 p.m. on April 10th at 16 Beacon Street. The Boston Bar Foundation’s Vaughan Fund was established in recognition of the 10-year anniversary of the BBA Lawyer for the Day Program and Wiley Vaughan’s stellar leadership. The Fund helps support the pro bono and public service projects of the Real Estate Section. This year, the BBF has raised over $5,000 for the Fund, allowing for the purchase of essential materials needed to run the program. Click here to learn more. Busy scene at the Boston Housing Court, where BBA volunteers have been providing legal assistance to landlords and tenants for 15 years. Did you know that approximately 90 percent of tenants and 50 percent of landlords in the Boston Housing Court don’t have legal representation? 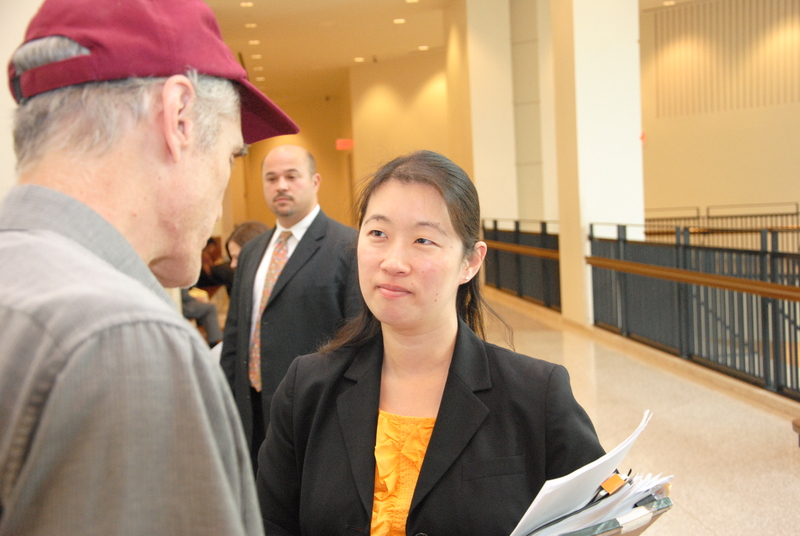 Since 1999, the BBA’s Lawyer for the Day in the Housing Court Program has acted as a lifeline for pro se landlords and tenants, with volunteers providing more than 15,000 pro se litigants with legal assistance. Attorneys at the Boston Housing Court on a Thursday morning assisting tenants as part of the BBA’s Lawyer for the Day Program. This year, the Program has been able provide representation to over 450 tenants and 100 landlords. Last Wednesday, the Program also launched a monthly initiative with Burns & Levinson LLP that will assist Section 8 clients facing eviction. As our members know, a lawyer can make all the difference for families who are facing the loss of their homes and landlords who need to better understand their rights. At Boston Housing Court, Lawyer for the Day Program volunteers Joanna Allison of the Volunteer Lawyers Project and BBA Real Estate Public Service Committee and Chris Saccardi of The Law Office of Christopher T. Saccardi. The Boston Bar Foundation Vaughan Fund covers essential materials needed to run the program, such as updated signage and nametags to allow for volunteer attorneys to be easily identified. This year the BBF has already raised over $5,000 for the Vaughan Fund. Are you interested in supporting this Program? Learn more about making a contribution or how you can volunteer. Join us in celebrating the 15th Anniversary of the Lawyer for the Day in the Boston Housing Court Program, on April 10th at 5:00 p.m. It will be an evening of food and drinks while we acknowledge the hard work of volunteers, Housing Court staff and the many others who make the program possible. R.S.V.P. online here. Stefanie Abhar, Mintz, Levin, Cohn, Ferris, Glovsky and Popeo P.C. Nicholas Bentley, Mintz, Levin, Cohn, Ferris, Glovsky and Popeo P.C. Attorneys volunteer at the Boston Housing Court on Wednesday and Thursday mornings through the Lawyer for the Day Program. 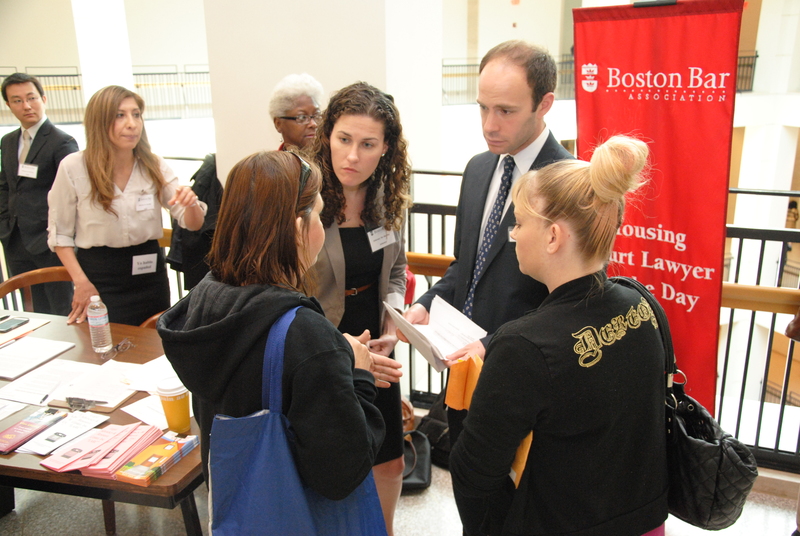 During Pro Bono Month, the BBA trained over 200 attorneys to take pro bono cases, including training over 50 attorneys to volunteer for the Lawyer for the Day program and the Boston Housing program. Though Pro Bono Month has officially ended, Beyond the Billable encourages its readers to take advantage of the BBA’s public service and pro bono initiatives year-round. If you needed any extra motivation, take a look at the four pro bono spotlights below, each of which highlights the commitment and participation of dedicated lawyers dedicated to pro bono work. For a full recap of Pro Bono Month, click here. Please contact Katie D’Angelo, Public Service Programs Coordinator, at kdangelo@bostonbar.org for more information on how to get involved throughout the year. 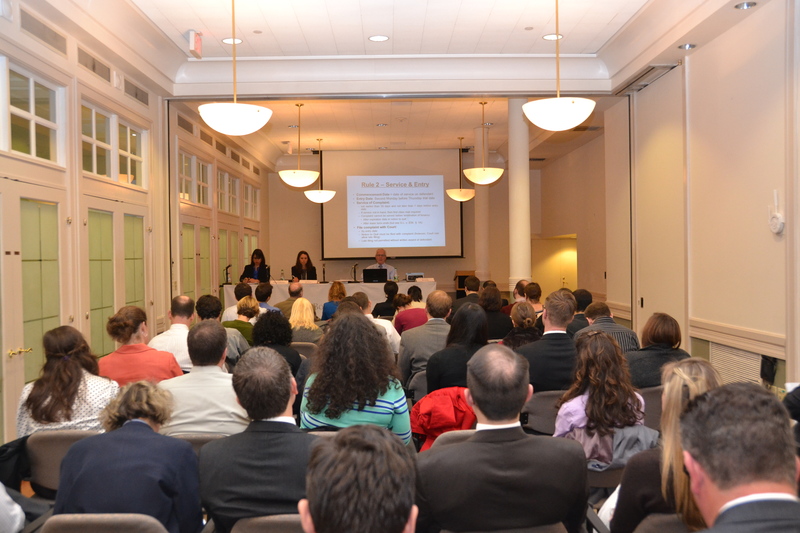 Attorneys interested in volunteering for the Lawyer for the Day in the Boston Housing Court Program attended the annual Landlord Tenant Basics Training last night at the BBA. The conference center at 16 Beacon Street was packed once again, this time thanks to eager volunteers looking to get involved in pro bono work in the Boston Housing Court. The Real Estate Public Service Committee and Volunteer Lawyers Project teamed up to host the annual Boston Bar Association Landlord Tenant Basics Training. Volunteers were prepped on what to expect and how to prepare to volunteer for the Lawyer for the Day in the Boston Housing Court Program by First Justice of the Boston Housing Court Jeffrey Winik, Katy Ward (Mintz Levin), Seth Malamut (Sherin & Lodgen), and Maria Theophilis (Broderick, Bancroft & Goldberg). 2. It makes a huge difference to the court and the litigant when the litigant has advice and/or representation. It makes the courts job cleaner and makes the litigant feel enfranchised. If you are interested in landlord tenant law, be sure to check out the upcoming training for veterans and military personnel. Click here to learn more. To support the Lawyer for the Day in the Boston Housing Court Program, contribute to the BBF’s Vaughan Fund here.